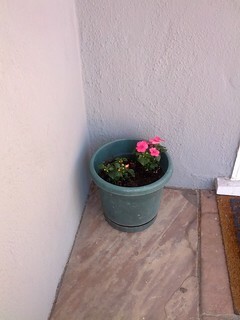 It's been about a month since I planted flowers. Let's see how they're doing! The photos on the left are from August 30th; those on the right are from September 26th, four weeks later. Click for larger versions! 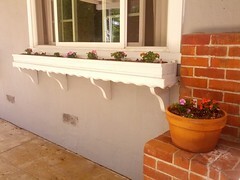 The plants in the pot and on the right side of the window box seem to be flourishing, but the ones on the left side of the window box aren't doing as well. And the one that used to be third from the left is just gone; something came along and just destroyed it! 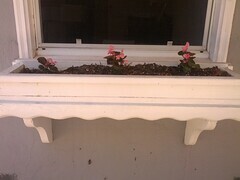 I do suspect that the left side of the window box gets more sun than the right side, and impatiens plants prefer shade, so maybe the ones on the right are doing better since they're more out of the sun. But I don't understand why whatever ate the missing plant decided to target just that one plant and leave the others untouched! 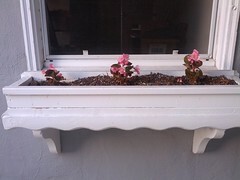 If the ones in the pot keep doing so well, I might dig one of them up and move it over to the window box to replace its fallen comrade. These seem to be slightly bigger than they were a month ago, but I wouldn't have perceived the change had I not taken the photos. They seem to be doing fine, but I do wish they were a bit bigger. 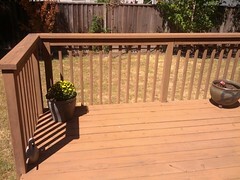 I planted them this far apart so they'd have room to get big! There's been a real change here; the chrysanthemums have gotten impressively bushy! 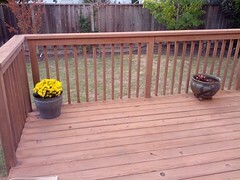 (There's another pot of mums on the other side of the deck that looks about the same as this one.) 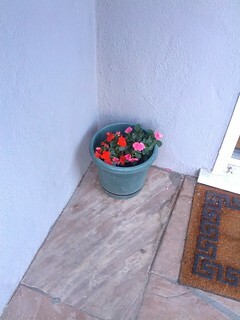 These begonias are also about the same size as they were a month ago, or maybe just a smidgen bigger. 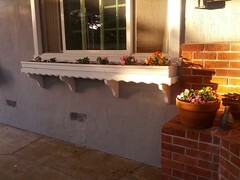 These have grown a lot, and they seem to be enjoying their shady spot by the front door. That's it for now! I don't have much of an idea how long I can expect any of these to stay alive, so I'm enjoying them while I can.